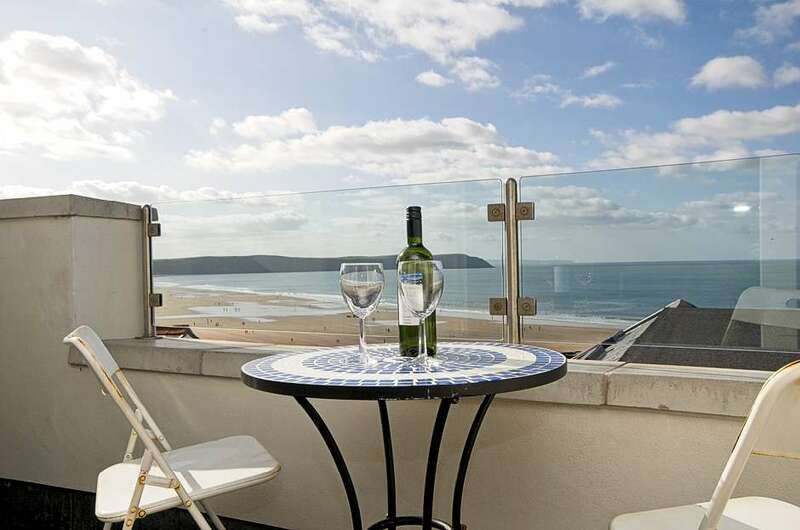 Holiday Home Hunter are delighted to be able to offer this lovely apartment with it’s seafront location overlooking Woolacombe Bay. This premier development provides parking, board storage and is positioned by the main beaches at Woolacombe. The private ground level entrance to No. 8 is at the rear of the building so access from the car is easy as the parking area is on this side of the building. On entering the apartment the two bedrooms lead off from the hallway along with the family bathroom. The first room is the smaller double with 4ft double bed. It is a comfortable room to sleep in, small but perfectly formed! Hanging rails, a small chest and and underbed drawers provide clothes storage. The main master bedroom is a good size with kingsize bed, large ensuite shower room, wardrobe and a delightful window seat to enjoy the front view over the beach and sea. The bathroom is on this level and is spacious and modern. The bath has a shower over the bath. Power showers were fitted in 2017. On the ½ landing is the kitchen with fresh white units housing everything including a microwave but excluding a dishwasher. On the top level of this striking duplex apartment is the main living room with fabulous new bi-fold glass front to the sea. This large room is in the eaves with sloping sections to the ceiling in some areas. One of the main features of this property is the long slim balcony which is set to take in the extensive panoramic view and has room for a café table and chairs. Please note: Children will need to be supervised at all times on this balcony. The oak topped dining table has chairs to seat 6, and is positioned near the French windows for the view. A TV, DVD and music system, sofa suite with sofa bed (only as an alternative to sharing the second bedroom but max 4 people staying in total), coffee tables and storage complete the room making this a really great place to enjoy sunny days and starry nights. Its possible to access the beach via the internal stairway of the apartment and out, down a few steps, across the road and you are there on Woolacombes famous beach! There is a little stiore for beach equipment at ground level just before exiting the building on the seaside. Cot, booster seat and stairgate are available if required. When booking please ask and these will be left out on your arrival. £20 charge per dog per holiday required at balance stage. Overall a fabulous seafront property with extensive views from the balcony, sleeps 4, takes 1 dog, Free WiFi, has 1 parking space and a visitor space on a first come first served basis and is just a short walk to the village and beach.